Open the People tool for the course you want to work with. Click Tools in the toolbar. If you don't see this in the toolbar, you don't have sufficient permissions. If the course has a Master Course, Buzz lets you choose to make changes to either the Master or to the course you're working in. Enrollments are not inherited from Master Courses. Click Add [plus sign] in the toolbar. If there are multiple roles available in the course, use the dropdown to indicate which role permissions you want this user to have. The first and last name (required). Click Enroll once you've found or created the user. Find the user(s) you want to drop and check the box next to their name(s). Click Drop [garbage can] in the toolbar. Easily Invite Students to join your course! 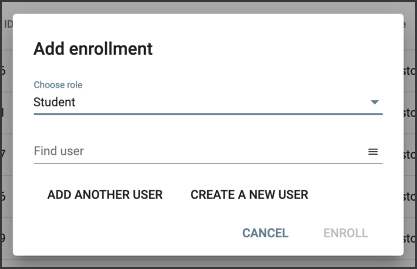 If you don't see Enrollments in your toolbar or the Create a new user button in the Add Enrollments window, but should have one or both of these permissions, contact your system administrator. I just want to add students so they can take the pre and post assessment for Foundations of Technology. Why can't I just upload my 8 classes into the system without having to type all that "stuff?" This system is NOT user friendly. Karen, I am sorry for your frustration. You are correct that a teacher can currently only add one enrollment at a time. However, there are a couple of other options that could be used. I appreciate your feedback and will note it for our team. I hope that these other options are helpful for your needs! I have 8 sections of classes with 36-46 students per class, a total of 300+ students. I use Edmodo as my web pressence, the grading app the district uses does not allow importing from other websites or apps, and I do not want to have multiple logins for my students. I have enough trouble getting them to check Edmodo assignments regularly, let alone their grades. I have initiated having a f2f training on Buzz, but not til after Labor Day. Guess the pre-test will have to wait.